Gerritsen Beach Cares recently issued two press releases asking for community support for their community projects. I found this on their website that they don’t use. It’s like a tree falling in the woods and no one is around to hear it….but me. GB Cares needs your help with reporting problems and requests to the NYC Parks Department. 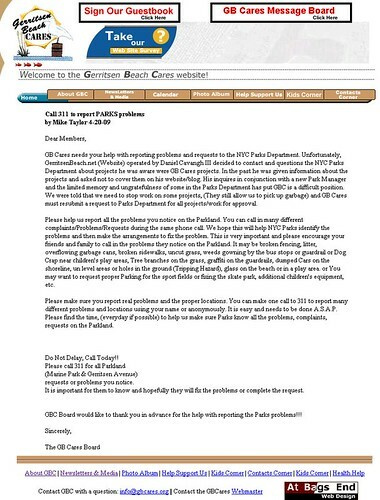 Unfortunately, GerritsenBeach.net (Website) operated by Daniel Cavangh III decided to contact and questions the NYC Parks Department about projects he was aware were GB Cares projects. In the past he was given information about the projects and asked not to cover them on his website/blog. His inquires in conjunction with a new Park Manager and the limited memory and ungratefulness of some in the Parks Department has put GBC is a difficult position. We were told that we need to stop work on some projects, (They still allow us to pick up garbage) and GB Cares must resubmit a request to Parks Department for all projects/work for approval. Please help us report all the problems you notice on the Parkland. You can call in many different complaints/Problems/Requests during the same phone call. We hope this will help NYC Parks identify the problems and then make the arrangements to fix the problem. This is very important and please encourage your friends and family to call in the problems they notice on the Parkland. It may be broken fencing, litter, overflowing garbage cans, broken sidewalks, uncut grass, weeds gowning by the bus stops or guardrail or Dog Crap near children’s play areas, Tree branches on the grass, graffiti on the guardrails, dumped Cars on the shoreline, un level areas or holes in the ground (Tripping Hazard), glass on the beach or in a play area. or You may want to request proper Parking for the sport fields or fixing the skate park, additional children’s equipment, etc. Please make sure you report real problems and the proper locations. You can make one call to 311 to report many different problems and locations using your name or anonymously. It is easy and needs to be done A.S.A.P. Please find the time, (everyday if possible) to help us make sure Parks know all the problems, complaints, requests on the Parkland. I also received this statement via email by former president, now Chairman of the Board Michael Taylor, who stated that this would be a mailer (sent to the neighborhood) and put in all of the stores on Gerritsen Avenue. GB Cares is temporarily suspending the Parkland community service program. As we await NYC Parks Department to reapprove our Parkland volunteer programs and activities. 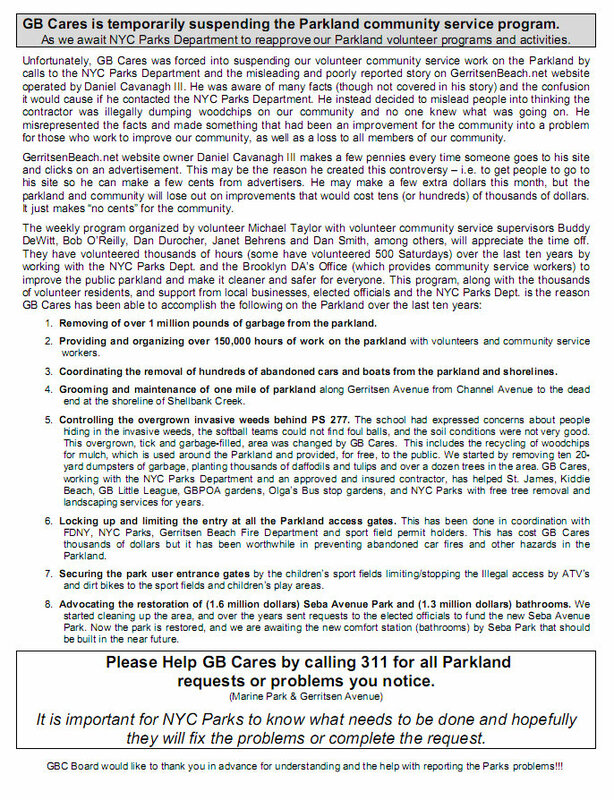 Unfortunately, GB Cares was forced into suspending our volunteer community service work on the Parkland by calls to the NYC Parks Department and the misleading and poorly reported story on GerritsenBeach.net website operated by Daniel Cavanagh III. He was aware of many facts (though not covered in his story) and the confusion it would cause if he contacted the NYC Parks Department. He instead decided to mislead people into thinking the contractor was illegally dumping woodchips on our community and no one knew what was going on. He misrepresented the facts and made something that had been an improvement for the community into a problem for those who work to improve our community, as well as a loss to all members of our community. GerritsenBeach.net website owner Daniel Cavanagh III makes a few pennies every time someone goes to his site and clicks on an advertisement. This may be the reason he created this controversy â€“ i.e. to get people to go to his site so he can make a few cents from advertisers. He may make a few extra dollars this month, but the parkland and community will lose out on improvements that would cost tens (or hundreds) of thousands of dollars. It just makes â€œno centsâ€ for the community. 1. Removing of over 1 million pounds of garbage from the parkland. 2. Providing and organizing over 150,000 hours of work on the parkland with volunteers and community service workers. 3. Coordinating the removal of hundreds of abandoned cars and boats from the parkland and shorelines. 4. Grooming and maintenance of one mile of parkland along Gerritsen Avenue from Channel Avenue to the dead end at the shoreline of Shellbank Creek. 5. Controlling the overgrown invasive weeds behind PS 277. The school had expressed concerns about people hiding in the invasive weeds, the softball teams could not find foul balls, and the soil conditions were not very good. This overgrown, tick and garbage-filled, area was changed by GB Cares. This includes the recycling of woodchips for mulch, which is used around the Parkland and provided, for free, to the public. We started by removing ten 20-yard dumpsters of garbage, planting thousands of daffodils and tulips and over a dozen trees in the area. GB Cares, working with the NYC Parks Department and an approved and insured contractor, has helped St. James, Kiddie Beach, GB Little League, GBPOA gardens, Olgaâ€™s Bus stop gardens, and NYC Parks with free tree removal and landscaping services for years. 6. Locking up and limiting the entry at all the Parkland access gates. This has been done in coordination with FDNY, NYC Parks, Gerritsen Beach Fire Department and sport field permit holders. This has cost GB Cares thousands of dollars but it has been worthwhile in preventing abandoned car fires and other hazards in the Parkland. 7. Securing the park user entrance gates by the childrenâ€™s sport fields limiting/stopping the Illegal access by ATVâ€™s and dirt bikes to the sport fields and childrenâ€™s play areas. 8.Advocating the restoration of (1.6 million dollars) Seba Avenue Park and (1.3 million dollars) bathrooms. We started cleaning up the area, and over the years sent requests to the elected officials to fund the new Seba Avenue Park. Now the park is restored, and we are awaiting the new comfort station (bathrooms) by Seba Park that should be built in the near future. 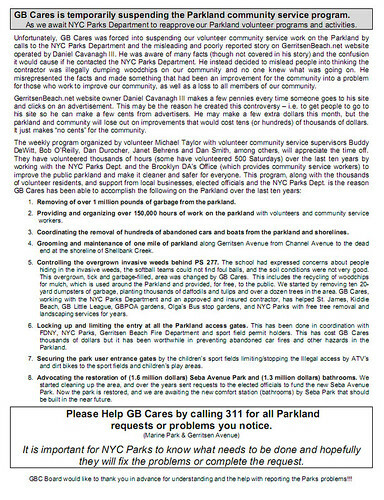 Please Help GB Cares by calling 311 for all Parkland requests or problems you notice. It is important for NYC Parks to know what needs to be done and hopefully they will fix the problems or complete the request. GBC Board would like to thank you in advance for understanding and the help with reporting the Parks problems!!! drama drama and more drama…just drop it!